offers professional writing lesson videos for all levels of writers! Sign up or log in to Magoosh Professional Writing. 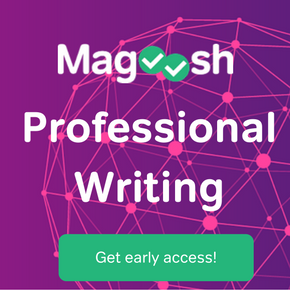 Professional Writing Become a better writer with Magoosh! Mind mapping is a great way to see the relationships between ideas. For mind mapping, you need to write out the ideas you generate into a map, with lines connecting the ideas that relate to one another. As you come up with ideas, you may notice new ways to connect them, helping you see a new angle on an old idea that your readers will enjoy reading about. Sometimes you need to sit down in front of a blank screen and just force yourself to write. Set a timer, think of a topic to start with, and keep writing until the timer ends. Then, scan through your writing and look for ideas that stand out. Then, use a mind map or other brainstorming method to continue generating ideas. To have information to share, you need to acquire knowledge first. Grab a book, find an article online, or look for a blog that relates to your business. As you read, write down ideas that you could explore in your professional writing. Another way to acquire new information to share is through listening to podcasts. Search the web for podcasts related to your business or topic, and think about ways that you could apply the information to your business. Also, consider ways to share the information to benefit your customers based on their needs. Get together with a group of people to discuss possible topics. For this method to be most effective, try to find people with viewpoints that differ from your own. You could pose a question and let people share their thoughts on the matter. While participating in the discussion, be sure to record thoughts that you have that you could share in a professional post later. What other ideas or products could you associate with it? How could you break it down into parts or components? How could you apply the idea in other ways? How could you argue for or against it? As you answer each question, think about how you could turn the answers into a post that your customers would benefit from reading. If you decide to have a brainstorming session with others, start with a question. It should be an open-ended one that could lead to further questions and greater ideas. However, if this sounds too daunting, start much simpler: think of a question that customers often ask you. Then, start brainstorming answers. Along the way, you just might come up with a topic that will help readers learn more about your company and product. You own a small bakery that specializes in freshly baked bread and pastries. Since starting a blog on your website, you’ve been struggling to come up with topics on a regular basis. Then, you find yourself sitting alone in your bakery. You close your eyes and think about the smell of bread wafting through the store. Then, you notice the sights, sounds, feelings, and (best of all) tastes associated with your store. You think about a childhood memory of eating pastries with your Nana or when you attended culinary school with friends. As you continue to walk down memory lane, you realize that these are stories that your customers would find interesting. Considering your senses, you may think of a story that you could share. Or, you may come up with another topic that would catch your readers’ attention. When you need to get your creative juices flowing, leave everything behind for a quick nature walk. Psychologists from the University of Utah and the University of Kansas completed a study where they discovered that time in nature helps people increase their creativity. So, get out into nature to boost your creativity, and maybe you’ll find some inspiration along the way. If you continue to struggle with brainstorming ideas for writing, try a keyword search. Type in keywords related to your business. Then, scan through the lists of top phrases that people search related to that keyword. You just might find something to write about that potential customers are interested in learning more about. What other techniques do you use for brainstorming ideas for writing? Share your tips in the comments below. P.S. Become a better writer. Find out more here. Jamie graduated from Brigham Young University- Idaho with a degree in English Education. She spent several years teaching and tutoring students at the elementary, high school, and college level. She currently works as a contract writer and curriculum developer for online education courses. In her free time, she enjoys running and spending time with her boys! What is a Business Proposal? © 2019 Professional Writing. All Rights Reserved.